The American Sector Restaurant & Bar serves a unique Victory Garden-to-Table menu, featuring locally grown vegetables and herbs, as well as hand-selected meats, seafood, and dairy products from local and artisanal producers. The menu is inspired by both regional and Southern favorites, such as Shrimp and Grits and an Oyster Po’ Boy, and All-American standards including the 5 Star Burger and Tabasco Cane Glazed Chicken Wings. The menu includes salads, gumbo, sandwiches, entrée provisions, and sweets. Vegetarian, vegan, and gluten free options are available. The American Sector Restaurant & Bar is open to the public without requiring admission to the Museum. Mon-Fri 11:00 a.m. – 6:30 p.m. The Museum has one paid parking lot on Magazine Street, across from The American Sector Restaurant & Bar, with an entrance on Magazine. Parking Validation is available for Happy Hour (4pm-6:30pm), with a purchase in The American Sector. Additional paid lots and metered street parking are located throughout the area. Jonathan David “JD” Eubanks is a former Naval Culinary Specialist and Metal-Band front man, Executive Chef and Louisiana Culinary Ambassador. Born and raised just outside of New Orleans in Ponchatoula, Louisiana, Chef JD learned butchering techniques from his farm-owner grandfather and participated in preparing food for the whole neighborhood, instilling the love of food at a young age. In high school, JD discovered his love of music and went on to become the front man for two metal bands before joining the Navy. He served as a culinary specialist under admirals, captains and other high ranking military personnel. Following his military service, JD continued to develop his culinary career by working for Wolfgang Puck Worldwide, Innovative Dining Group, and Fox Restaurant Concepts. He has also competed and won in “Guy’s Grocery Games” on the Food Network, competing against other military veteran chefs and donating his winnings to charity. JD recently started working for charity organizations in the New Orleans area, including Bastion Community of Resilience, a military-owned charity that helps warriors from many different battlefields regain their confidence and their lives. He also helps multiple local veteran’s charities, cooking meals for them in his free time. BB's Stage Door Canteen presents a wonderful weekly series of unique entertainment, showcasing the songs, style, stars, and spirit of this incomparable era. Enjoy evening and matinee performances by headliner acts, signature musical productions, big bands, dancing, the Victory Belles vocal trio, and more, plus preshow dinner, brunch, or lunch by The American Sector Restaurant + Bar. 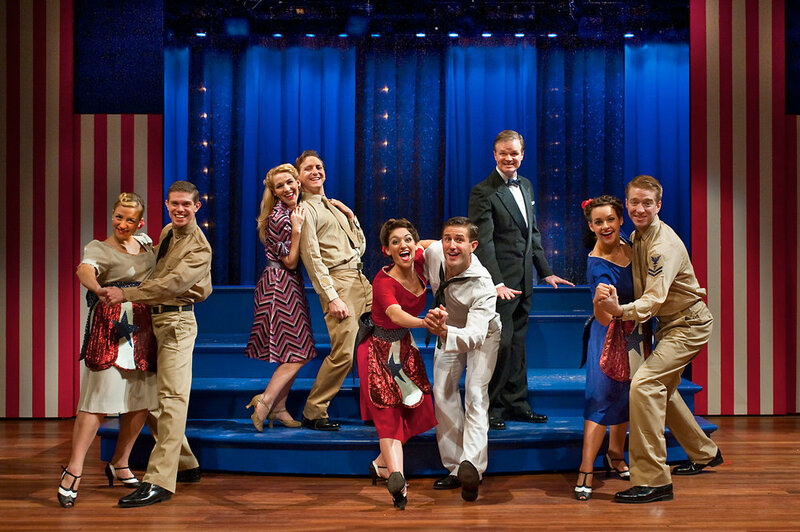 It's all at BB's Stage Door Canteen! 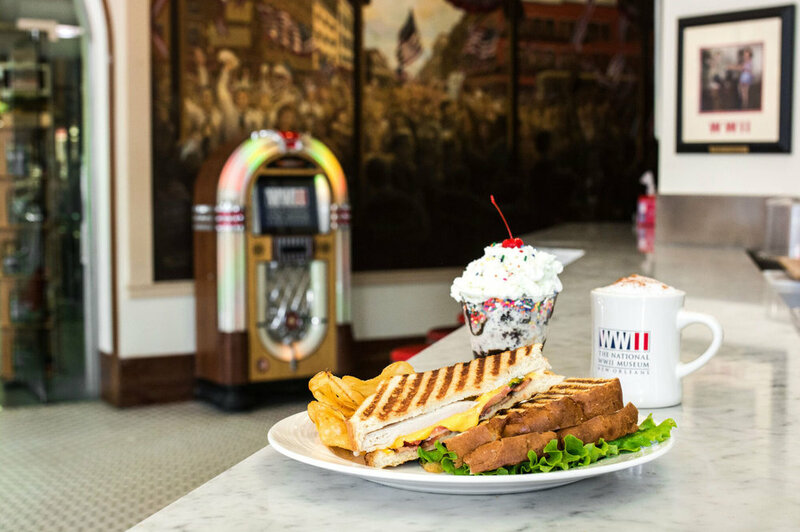 Jeri Nims Soda Shop, located within The National WWII Museum, can also be accessed at the corner of Magazine Street and Andrew Higgins Drive, The Soda Shop is open daily from 7:00 am to 5:00 pm and offers breakfast, lunch, or a sweet treat. As the only Scoop Shop in the Warehouse District, it really hits the spot.